Foxes Reach01600 860341work Self-cateringFive star comfort in the Wye Valley village of Catbrook , near Tintern. Sleeps up to six in four bedroms. Two doubles and two singles. Hot tub included. Flagged floors. Woodburner. Wonderful Touring and Walking Base. Enclosed sheltered garden . Excellent for cycling, walking, fishing and riding. Rural but not isolated. Fabulously cosy for winter breaks. Close to Tintern Abbey and The Whitebrook, a Michelin Star restaurant as well as many other eateries and places of interest to visit..
Gold level green award. Winner of many National awards including National Tourism Awards Best self catering 2018. 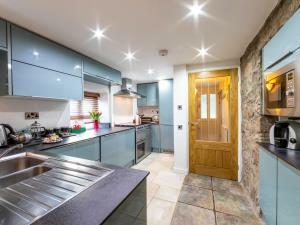 Spectacular open plan kitchen and dining room with limestone floor and fully integrated appliances. Five star comfort in the Wye Valley village of Catbrook , near Tintern. Sleeps up to six in four bedroms. Two doubles and two singles. Hot tub included. Flagged floors. Woodburner. Wonderful Touring and Walking Base. Enclosed sheltered garden . Hot tub for exclusive use of cottage guests Encolsed shetlered garden with furniture. Pet friendly. Brilliant local walking. Travel cot and stairgate available. Fully central heated (included in rental) Children welcome from any age.